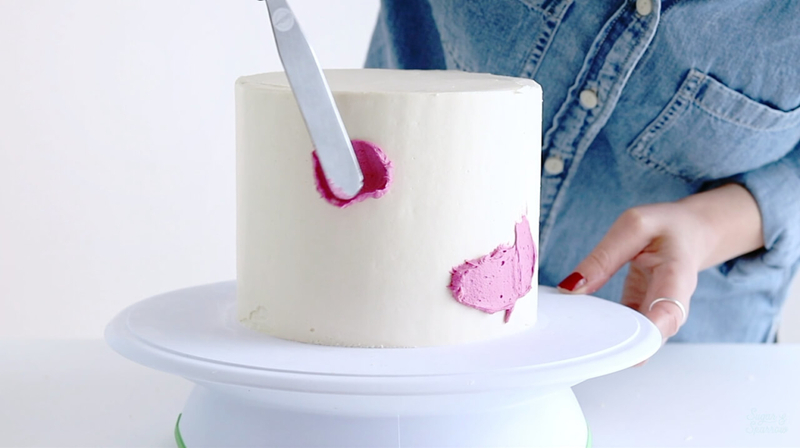 Let me tell you about the most freeing cake project I’ve ever created: I had a smooth, frosted cake on the turntable as my blank canvas, a pretty buttercream color palette set before me, and absolutely no vision of what the cake would look like in the end. The only thing I was sure of was that I was going to play with some bold buttercream colors. 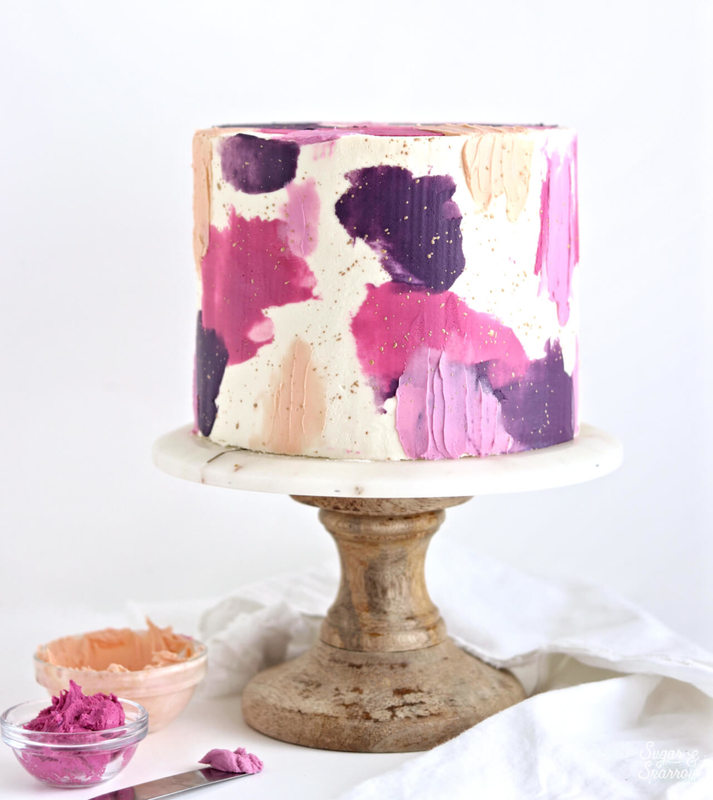 With a great album on in the background to keep me company, I started by adding a big color swatch onto the cake, then a few more, then spatula painted the buttercream wherever I felt like, and ended it all with a good splatter painting sesh. It was the first time I truly let myself go in a cake decorating session with no real expectations or rules, and that’s exactly why I want to share the process with you! The only real decision that’s important to make before you start decorating is choosing your color palette. 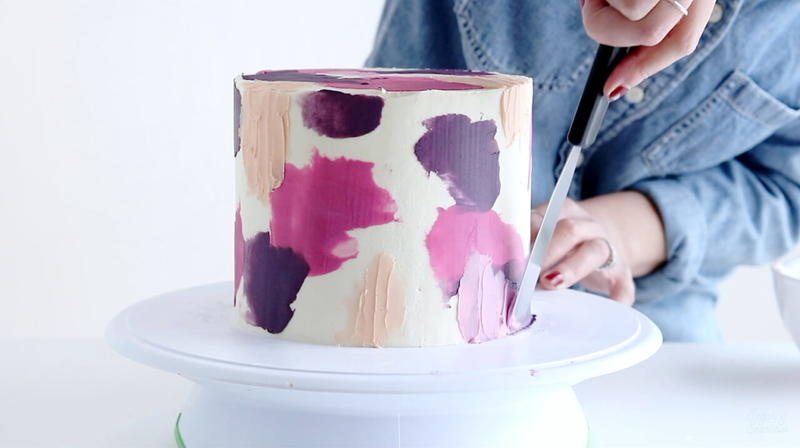 Each time I’ve used this technique to decorate a cake, I’ve chosen four different colors to make it come to life. I usually start by mixing up one bold mid-toned color, make a darker color to contrast it, then pair those with two lighter pastel colors to use for the spatula painted portions. It will work with any color palette, so just choose four colors that you’re crazy about and run with it! 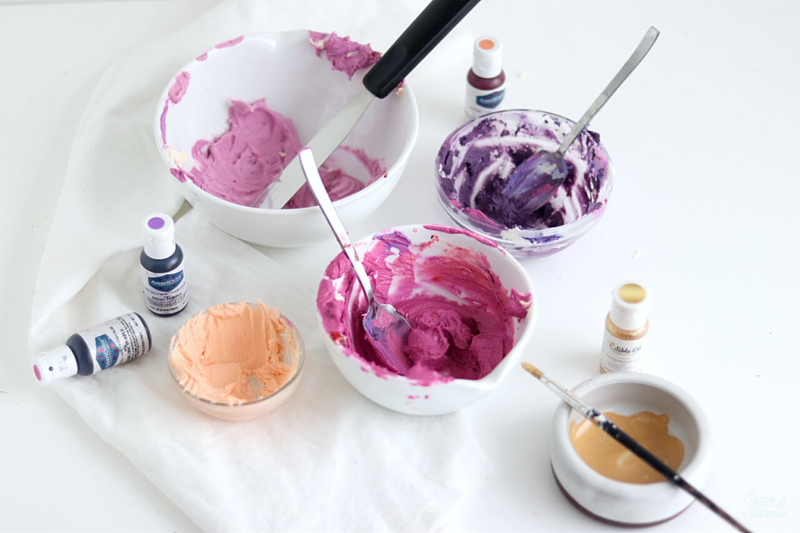 Divide the buttercream into four different bowls, reserving a bit of white buttercream just in case you need to lighten a color. Then, use your food color gels to create the color palette of your choice. 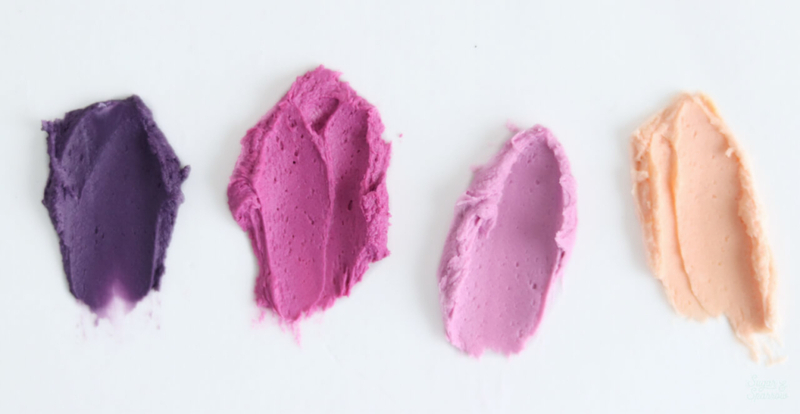 The color gels I used for this specific color palette are all Americolor: Eggplant mixed with Regal Purple for the darkest color, Fuschia for the mid-toned color, Peach and Lilac for the lightest colors. 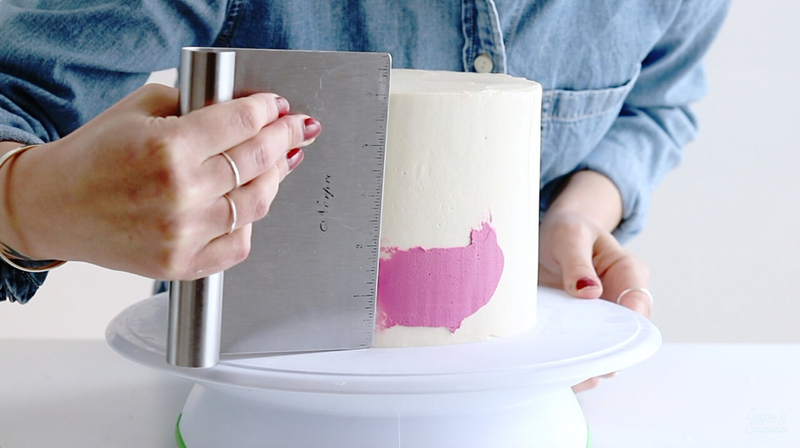 Make sure your cake has been chilled for at least 30 minutes and is firm to the touch before starting the painting process (aka where the fun begins!). Choose two different colors to use as your big, bold swatch colors. I always pick the darkest color and the mid-toned color, but you can use any colors you feel would be the most fitting. 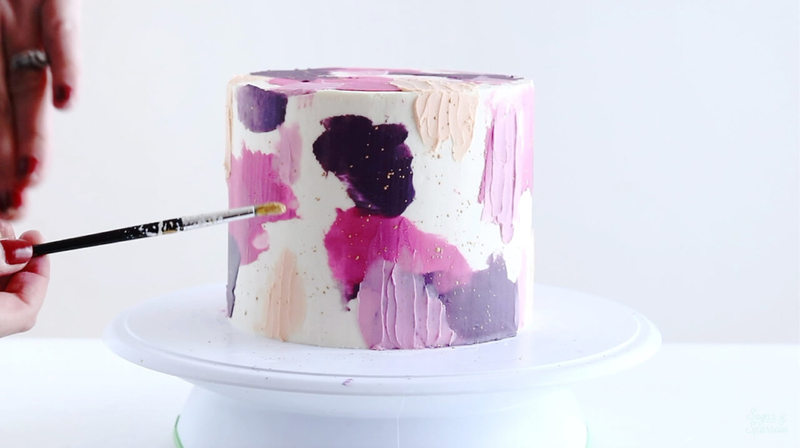 One by one, use your small icing spatula to apply color wherever you want on the cake, then use your bench scraper to scrape off the excess and create smooth color swatches. It’s best to have a few paper towels handy throughout the process, because you’ll need to clean your bench scraper every time you smooth out a color to get a clean finish. Repeat the process until you’re happy with how many swatches are on your cake, remembering to leave enough blank space for spatula painting. 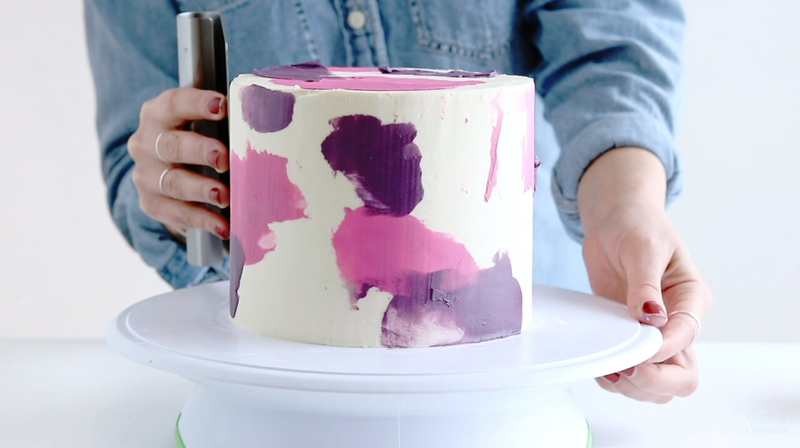 Wherever you feel like, use your icing spatula to apply the final two colors, spatula painting them on in strokes. There’s no right or wrong here, so feel free to overlap your color swatches and go with the flow on how long or short your spatula painted strokes end up. Make sure you clean your icing spatula when switching colors, unless you want the strokes to end up with colors mixed together. 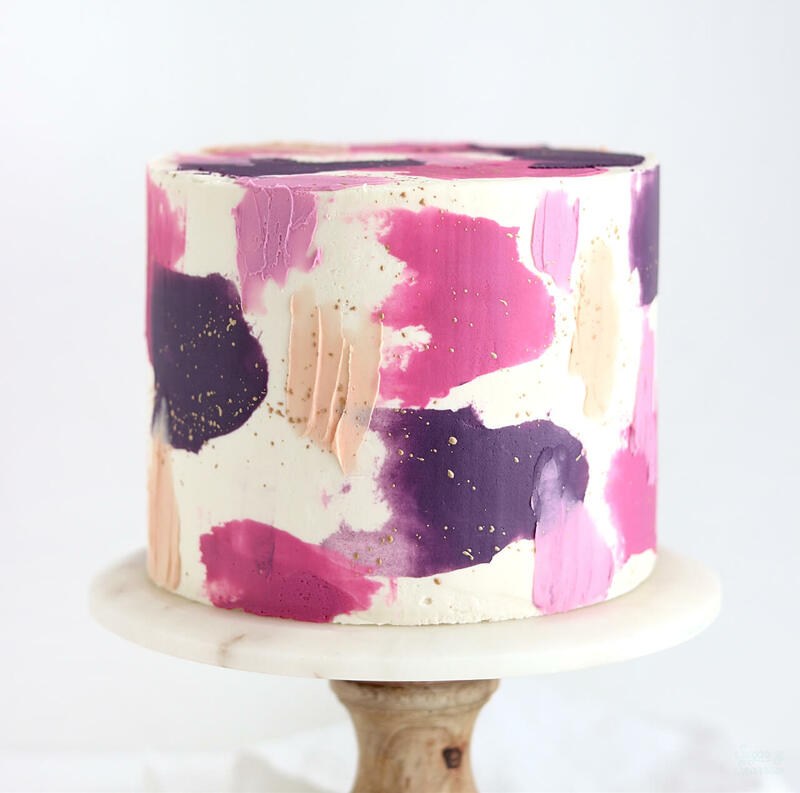 I absolutely love splatter painting cakes, so I chose to finish the design by splattering some Edible Art Paint in Glamorous Gold all over my colors. 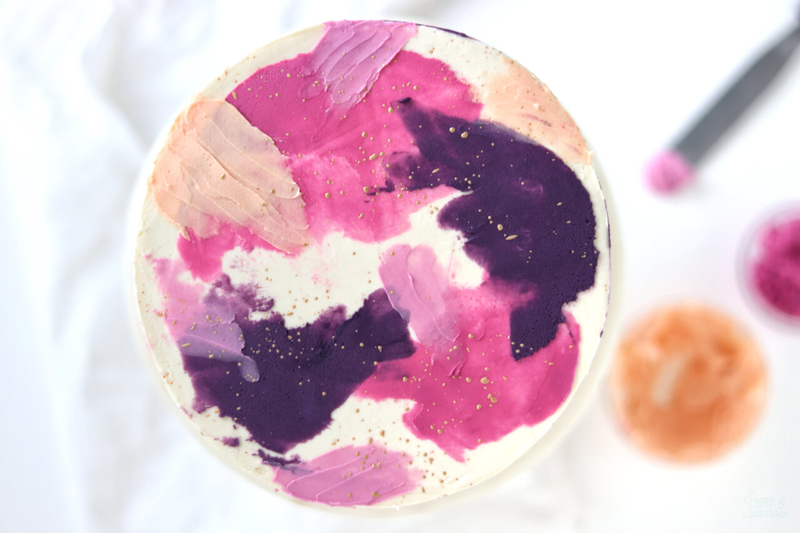 You can use any kind of edible paint or luster dust mixed with alcohol for this part, but I love Edible Art Paint because it’s already pre-mixed and ready to go. Just pour a little bit into a bowl, dip a food-grade paintbrush into it, and splatter until you love what you see. And that’s it! Three different cake decorating techniques combined to make art. 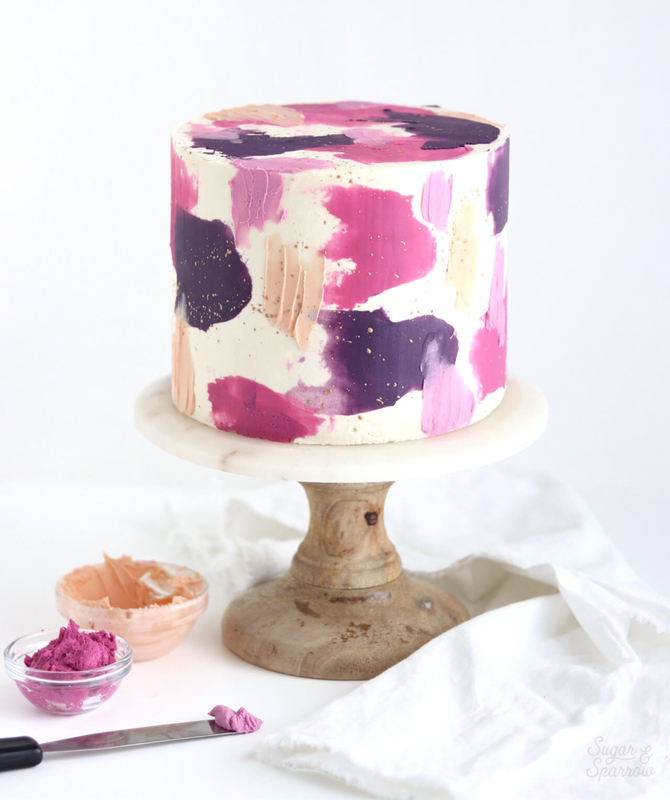 The best part is that every cake design you create with this approach will look totally unique, and it’s so easy that you can just relax and enjoy the creative process. I hope painting with buttercream is as therapeutic for you as it is for me! If you create a cake with this tutorial, I’d LOVE to see your artwork. Be sure to tag me on Instagram to show me! Disclosure: this post does contain some affiliate links, meaning I may receive a small commission if you click them and purchase items I’ve recommended. Clicking these links won’t cost you any extra money, but they do help to keep Sugar & Sparrow up and running. Thank you for your support!